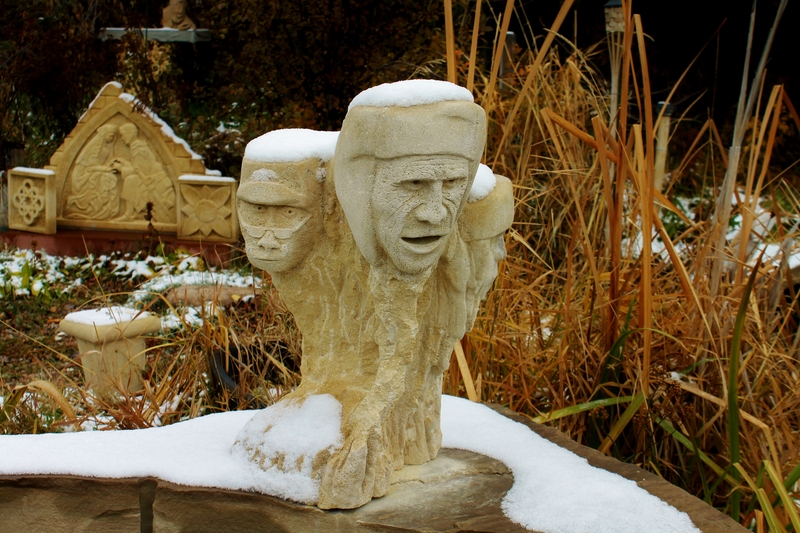 The three Snowgoyles, ‘The Pirate’, his ‘Faithful Monkey’ and ‘The Ice Man’, emerged from within a solid and consistent block of Kansas Creme limestone that I had split previously into an appropriately top-heavy rectangle. With plenty of room to work with I first worked out ‘The Pirate’, as seen crowing the Ice Palace for several sub-zero nights atop of the arbor that dominated the Birdhaven Studio Sculpture Garden in Woody Creek. Before too long these ghostly icy shapes morphed into other equally vivid and imaginative shapes, but none left the impression that these two intrepid voyagers brought with them. The carving process was very much a hand tool affair, with the rhythmic blow of mallet and chisel providing much in the way of an upper body work out – which was fine, as the weather, in direct contrast to the inspiration, proved as fine as Colorado Rocky Mountain Summertime can be. Subsequently, down through the years the three Snowgoyles have stared out upon quite every sort of weather and condition possible – from hot blistering sun, to driving hail, to being buried in feet of snow – yet they show not a jot of wear. And nor are they likely to either, for many years to come, such was the perfect state of the Kansas Creme limestone block that I had to begin with, and so appropriate was the designation I assigned to it. Although each of our three Snowgoyles face entirely different directions you may notice that they all scan the same horizon, with Ice Man surveying in one direction, and The Pirate and his Faithful Monkey apparently transfixed upon a possible object dead ahead. With hope in his heart, and greed on his mind, the pirate appears to be calculating matters of distance and possible resistance, the monkey however, perhaps recalling past adventures, seems to be reading a situation more akin to, “oh no, here we go again”. This entry was posted in All Postings, Gallery of Limestone Sculpture, Gallery of Sculpture, Gallery of Sculpture FOR SALE, Gallery of the Human Form, Gallery of Whimsy, Posts about my Sculpture, Posts about the Sculpture Garden, Posts with Stone Carving Demo Videos, Posts with Videos and tagged Art, Birdhaven, Colorado, Gargoyles, Hand Carved, ice, Ice Palace, Kansas Creme, limestone, Martin Cooney, monkey, outdoor, Pareidolia, pirate, sculptor, Sculpture, Sculpture Garden, Snow, Stone, Woody Creek. Bookmark the permalink.